Pattern will be clear and complete when riding speed reach 12.5 mile/h. If speed is below 12.5 mile/h, patterns will show half or a portion. 2. Feel free to use on rainy days with waterproof IP66. 3. Auto open & close(controlled by motion sensor), with Manual Switch, energy saving. Press "on/off" button, enter auto mode, then light glows when bike moves, turns off after stop moving for 30 seconds. Or Just use the button to turn on or turn off bike wheel lights. 4. Fits for standard spoke bikes, 16 inch & above. Note: if install 2pcs bike wheel lights in symmetrical spokes for one wheel, riding speed no need reach 12.5 mile/h to display complete pattern, when it reach 9.3-10 mile/h, it will also display complete pattern. Awesome Birthday Gifts & Popular Christmas Presents for Boys, Girls, men, women, kids, husband, wife and everyone. And best gifts for Mother's Day, Father's Day. 30 PATTERNS CHANGES & BOTH SIDES DISPLAY GRAPHIC - Each led bike spoke light contain 14PCS RGB Leds, each side 7pcs Leds, each led can flash 8 colors, high brightness, ensure your bike visible at night. Moreover, this colorful led bike wheel lights can flash 30 different patterns, patterns change every 4 seconds. DIFFERENT SPEED, DIFFERENT EFFECT & EASY INSTALLATION - It was controlled by riding speed, MORE FAST, MORE COMPLETE AND BEAUTIFUL! When riding speed reaches 12.5 mile/h, the patterns will become complete. When speed below 12.5 mile/h, the bicycle wheel lights will display half or part of the pattern; Easy to install, don't need any other tools, only need several seconds, this bike wheel lights can be installed safely. TWO OPERATION MODES (AUTOMATIC LIGHTING, WITH MANUAL SWITCH) - This bike spoke lights are controlled by motion sensor & manual, differs from other bike wheel lights. After the bike spoke lights are installed, press "on/off" button, enter auto mode: light glows when bike moves, turns off after stop moving for 30 seconds. Manual Mode: Just use the button to turn on or turn off the bicycle spoke lights. EASY TO USE. WATERPROOF - IP66 waterproof design. No longer worried about the bike wheel lights will be damaged when riding in rainy days, and it can be used in any weather conditions, but pls don't soak the bicycle tire lights in water. 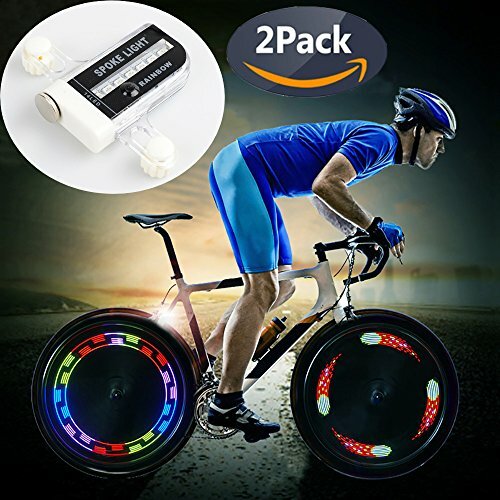 LIGHTWEIGHT AND SAFETY - QANGEL bike tire light size: 3.74*2.76*0.59 inch(W*L*H), weighs only 2oz, won't affect cycling speed and gravity force. High brightness bike wheel lights keep your safe in low light conditions; it is safety for night riding. The Led bike wheel light also can be used for warning. Power by: 1 X AAA Battery (NOT INCLUDED). Fit standard spoke bicycles, 16inches & above - not suitable for bicycles with wide spokes or sparse spokes. If you have any questions about this product by QANGEL, contact us by completing and submitting the form below. If you are looking for a specif part number, please include it with your message.